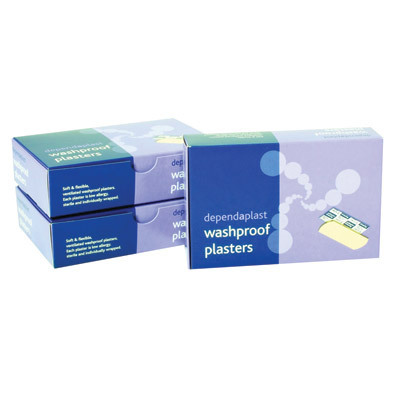 Replenish your first aid box with the help of our Washproof Plasters. Each one is provided pre-sterilised and individually packaged to help with storage before use. The hypoallergenic material used in their construction is both conformable and breathable, allowing the wound below to heal quickly without the risk of external irritations. These washproof plasters have a protective film that can be peeled off before use and acts as a barrier between the wound pad and outside dirt. The non-stick wound pad has a high absorbancy for drawing moisture away from the wound in question alongside a low-allergy adhesive bond to reduce irritation. Here at Gompels, we have a wide range of plasters available to suit all requirements. From our Large Fabric Plasters through to Washproof Disc Spot and Washproof Tape in Blue for catering environments, you'll find exceptional wholesale prices combined with high-quality products.